Leadtek WinFast 7950 GX2 TDH also known with commercial name of Leadtek WinFast PX7950 GX2 TDH. Leadtek WinFast PX7950 GeForce 7950 GX2 TDH features NVIDIA GeForce 7950 GX2 with PCI Express graphic bus support, high-speed GDDR3 memory on board, dual dual-link DVI, dual 400MHz RAMDACs, Microsoft DirectX 9.0 Shader Model 3.0 support, HDCP ready, high dynamic-range (HDR) rendering support, NVIDIA PureVideo technology, integrated HDTV encoder, CineFX 4.0 engine, UltraShadow II technology, 64-Bit Texture Filtering and Blending with Advanced Memory Control, NVIDIA Intellisample 4.0 technology, OpenGL 2.0 Optimizations, NVIDIA ForceWare Unified Driver Architecture (UDA), NVIDIA nView multi-display technology and NVIDIA Digital Vibrance Control 3.0 technology. The Inquirer (dead link) has a first impression on Leadtek WinFast 7950 GX2 TDH and concludes that Geforce 7950 GX2 based Leadtek WinFast PX7950GX2 TDH kits ATI’s X1900 XTX but in every single scenario. If you want to turn the FSAA on and to play at higher resolution this is the card for you. At 521 it is reasonable expensive and will definitely be the fastest card the money can buy for at least a few more moths, till sometimes in September anyhow. Performance wise Leadtek 7950 GX2 is the fastest non overclocked card around. 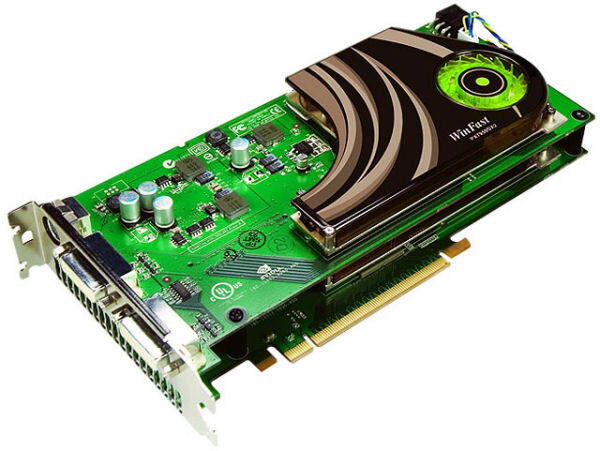 The only disadvantage is lack of HDR and FSAA capability which is a shame but if you want the performance this is the card for you. ATI don’t have the forces to fight it properly until end of September while we expect to see the new R580+ based Radeon X1950 XTX card out. But beware G80 should be out at the same time. Until then Geforce 7950 GX2 cards are the fastest one that money can buy.